Last fall (I haven't ridden my bikes since), I had a tube slowly go soft on my commute into work so when I realized it, I stopped (fortunately, in the park where I could set up at a picnic table). I can't quite remember the details but I usually carry at least one spare tube but for some reason, I didn't use it (was it also punctured and I had neglected to repair it? I don't remember). So, I decided to just spend the time and repair the tube that was on the bike. Well, that failed too because the 2 tiny glue "tubes" were both empty and neither had been used. The tire was a bit soft when I started my commute so I pumped up the tube and rode 10km to the park before this stop so I figured, if I did the same, the air in the pumped-up tube should last the remaining 3km and it did (I think I called my wife for a ride home that afternoon). So, I'm fed up with these tiny little tubes of glue and would like to buy a larger bottle of something that would replace it. Can you recommend a brand/type of glue that I could use? My commuting bike is a touring bike with rear panniers so space/weight isn't a concern. once a tube has been opened, its always best to remove as much air from it before quickly recapping it. Even with that, depending on the cap, they can dry out over time. One solution I find that helps is to buy patch kits that have two little tubes instead of one, at elast this way you probably will have one thats never been opened before--and also checking the tubes right away at the store to see if they feel full etc when new. at MEC, they used to sell kits with two little tubes, I prefer to buy those. also at MEC, they used to sell a large tube of glue, and I've had one for a long time, a few years at least, and the last time I used it, it was still good. for trips, I make sure I have two little new tubes, unopened. look into the larger tube of glue at mec, its worth getting one, a bit bigger and heavier of course, but if kept well closed and inside a baggy, i figure its worth it. when I looked in stores for larger tubes of glue, didnt find any, but was glad to see that MEC had them. Probably cost 5 bucks or thereabouts. haven't used them, and am frankly wary, have read of some long term problems, but hey, try em out. A few years back, I bought a cup can of vulcanizing glue and a big box of patches. I always carry 2 tubes and 3 on our tandem rides. At home I keep a small bottle of rubber cement. You can carry with you. Seems to last a long time. As often as you seem to get flats, just buy a new REMA kit at your LBS every few years. I had to do a patch a couple days ago and used a tube that had been opened at least 3 years ago. As suggested, push the air out before reinstalling the cap. They'll get you home, but tend to fail on your next flat if you fill the tube with air looking for the new hole. They don't stretch as well as the tube and tend to fail at that time. "haven't used them, and am frankly wary, have read of some long term problems, but hey, try em out". Their purpose is Short Term.. to get you home, or to say a comfortable Cafe to do a proper tube patching job..
"Their purpose is Short Term.. to get you home"
Exactly how I use them as well. When I get home the patch gets peeled off and a proper patch installed. Sometimes they don't come off nicely and the tube gets replaced. guess I'm lazy, but when I get a flat, I put in my spare tube after checking for debris in tire etc, then at home I properly patch the tube. I'm not in a race, so even if I were to patch on the roadside, I'd rather do it once and know its good to go for years, no surprises, no redoing it later. Smearing some glue on, waiting 2 mins max for it to dry and then putting on a proper patch is such a small amount of time compared to removing a wheel, tire, etc., but thats me. Depending on where your bike is stored, you may need to refresh your patch kit glue a couple of times a year. I left a couple of patch kits in a garage in Arizona last summer and there wasn't a bit of glue left in either. The patches got brittle, too. If you don't use it very often, rotate a fresh one in. I haven't patched a tube out on the road in ages, but have always carried a new, unopened tube of "glue" in the tool kit. Even an unopened one has dried out on me when I go to use it at home. There are numerous options to buy an 8oz. can of vulcanizing fluid. Just due to the amount it should last a long time before drying becomes an issue. There used to be a few distributors that carried small tubes of Maruni patch cement--I don't think anyone does, anymore, though. You can buy small tubes from Rema, or 8oz cans, though. Most bicycle shops can order them. Thanks everyone, I'm going to look into Rema. And, like one other has said here, the patch kit came with 2 tubes of glue, one had not been opened and it was empty. these must be the one I have, larger than the ones in patch kits, but still fairly small. On one trip, I took one of them, and two small ones, and a whole slew of different patches, thinking that I'd be running into problems with lots of flats, but was lucky. I buy a big can of Rema and Heptane as solvent. For the road I fill small glass vials closed with metal caps (off Ebay), so I can see whether the glue stays liquid. Incidentally by volume most of the glue content is the solvent. Once every half a year I may add a bit of solvent. Last edited by 2_i; 03-21-19 at 06:52 AM. .. Or just replace your patch kit once a year or every other year. Its just a few $. Hardly worth obsessing about. I tend to have bad luck, and for the Rema, I run out of the round patches before the glue goes bad. I have a crapload of the big patches now (never had a use for them on tubes in 23/25 tires). Typically I don't try to save the glue from the old case when I open a new green touring 01 Rema case. "so even if I were to patch on the roadside, I'd rather do it once and know its good to go for years, no surprises, no redoing it later." Two years ago I got caught with an empty glue tube and had to walk 5 miles home. That is when I changed to the glue-less patches. understandable, I get about a flat per season on average, but this is why I like having two small glue tubes always in my little patch kit box. 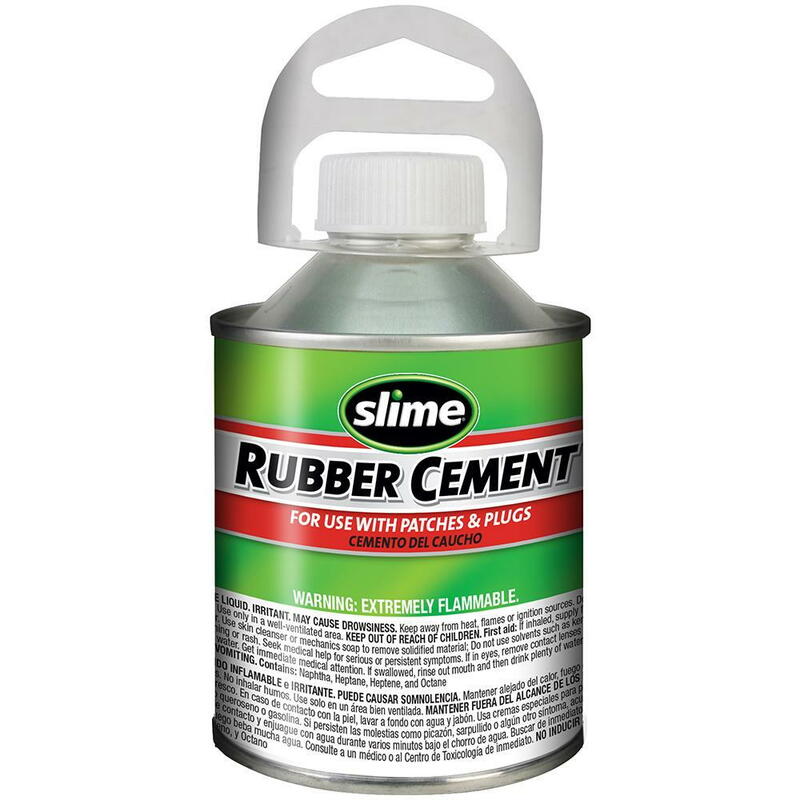 At our shop we repair about a dozen tubes weekly so buying this Slime product goes a long way, an 8 OZ can of patch glue and comes with a built in brush. Work well with bulk purchases of Rema patches. I'm no expert by any means. We are a charity bike shop so we are more frugal thus patches & glue are cheaper than tubes. We find it easier to do multiple tubes at a time. and when completed they are put into the stock rotation. We rarely see a patch fail. We never attempt to patch a major blowout or damage immediately surrounding the valve. We let it sit with the 2 small wood (2"x1"x1/2") blocks & a spring clamp until the next day. Last edited by JoeTBM; 03-23-19 at 03:14 AM.